March Madness starts next week and Selection Sunday is tonight, but that doesn’t mean that there is no NBA to bet on. There is a big slate on Monday and I have three picks to share with you guys. You can bet on these free NBA picks at BetOnline and get a $1000 bonus when you sign-up and make your first deposit. The bonus can be used to bet on the NBA, March Madness or any other sport. The Raptors (39-26) hold a 2-0 (2-0 ATS) lead in the H2H series against the Pacers (30-35) this season, but this is a great spot for Indiana to pick up a big home win and stay in the playoffs. 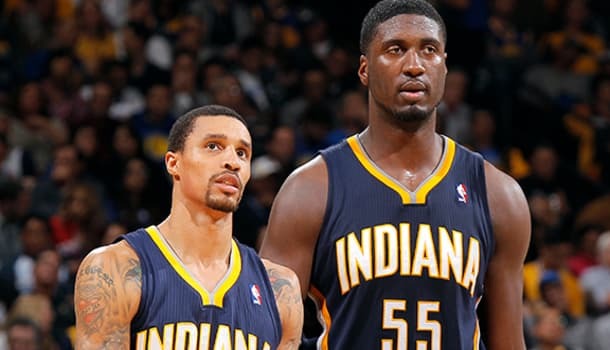 Toronto are 2-8 (3-7 ATS) in their last ten games, while the Pacers are 8-2 (6-4 ATS) in their last ten games. The Pacers are playing the best basketball they have all season and will cover ATS. These teams are basically the complete opposite as well. Indiana plays strong defense (96.0 PPG – 3rd), while only scoring 96.5 PPG (23rd). Toronto scores 104.4 PPG (5th), but they give up 101.2 PPG (22nd). Toronto are playing Portland tonight at the ACC too, which is another reason I like the Pacers to jump out to an early lead and win tomorrow night. Toronto will have to travel and be on no rest. George Hill has really come on strong after being injured earlier in the year. Hill leads the Pacers with 14.5 PPG, 4.7 APG and 1.0 SPG. If Hill matches Lowry’s production the Pacers will win. The Cavaliers (42-25) are on the road tonight in Orlando before playing Miami (29-36) tomorrow. That isn’t a huge concern, as they don’t have to travel far at all and they’ll likely rest starters late tonight. Cleveland are 7-3 in their last ten games and they have moved into 2nd place in the East. Miami are 5-5 in their last ten games and ever since Bosh went out with a season-ending injury – Miami has struggled. Wade is playing banged up and hasn’t been at his best in a long time. Whiteside has come back down to earth lately. As a team, the Heat are scoring just 94.5 PPG (28th), but they only allow 97.1 PPG (7th). James, Irving and Love have all been taking turns having big games. The Cavs rank 6th in points scored (103.3 PPG), 11th in points allowed (98.8 PPG) and 17th in rebounding (43.1 RPG). The Thunder (37-29) just beat the Bulls this afternoon and they’ve now won two in a row. OKC is 8th in the West and fighting to stay in the playoff picture, while dealing with multiple injuries. Durant and Adams are definitely out, plus Ibaka is still questionable, as he didn’t play today. It’s going to be tough to beat the Mavericks (42-25) who come into this game with only Aminu questionable. Dallas has a lot of depth with Ellis, Rondo, Nowitzki, Chandler and Parsons. They rank 3rd in scoring (104.6 PPG) and 8th in assists (22.4 APG). They play like a team and can score points quickly. If OKC was healthy I’d give them a much better chance at beating Dallas on the road, but without Durant and potentially Ibaka — the Thunder are going to struggle keeping this game close.